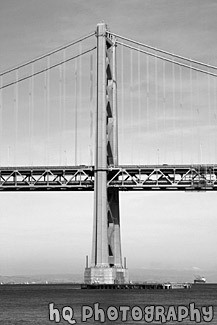 This is a scenic black and white picture taken of the Bay Bridge in San Francisco, California which connects San Francisco to Oakland. This photo was taken on a cloudy day and you can see the details of the clouds in the photo. This photo is taken from the San Francisco side looking towards Treasure Island. 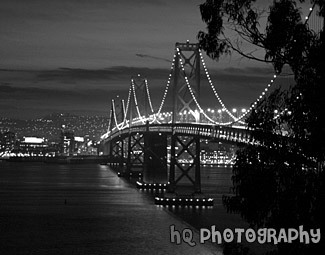 A scenic photo of the Bay Bridge in San Francisco, California taken in black and white and night. This photo is taken from across the San Francisco side looking at San Francisco. The Bay Bridge connects San Francisco to Oakland. The Bay Bridge opened to traffic on November 12, 1936. The total cost, including an electric railroad which has since been abandoned, was $79.5 million. 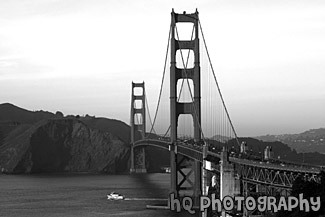 A black and white scenic photo taken of the Golden Gate Bridge in San Francisco from the Presidio. Today the Presidio is enjoyed through the history and beauty it contains. Within the Presidio boundaries there are more than 500 historic buildings, a collection of coastal defense fortifications, a national cemetery, an historic airfield, a saltwater marsh, forests, beaches, native plant habitats, coastal bluffs, miles of hiking and biking, and some of the most spectacular vistas in the world... not to mention the spectacular views of the Golden Gate Bridge. 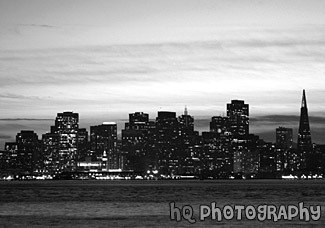 This is a scenic black and white photo of San Francisco, California taken from across the city at night. San Francisco is located in the bay area just north of San Jose. 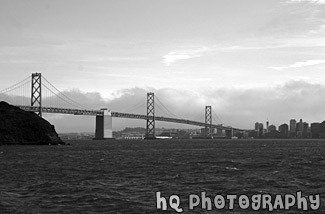 A scenic vertical picture taken of the Bay Bridge from San Francisco, California wharf area. This picture is in black and white and was taken on a sunny day. 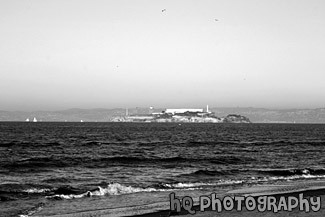 A scenic black and white photo of Alcatraz Island taken in San Francisco, California. By the late 1850's, the first military prisoners were being housed on the island, but it did not become a Federal prison until 1934. On March 21, 1963, Alcatraz closed after 29 years of operation. There were 36 different men involved in 14 escape attempts from prisoners while on the island. Officially, no one ever succeeded in escaping from Alcatraz, but to this day there are five prisoners listed as "missing and presumed drowned." 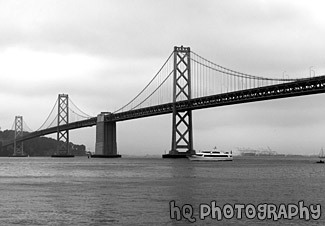 A scenic black and white picture taken of the San Francisco Bay Bridge from across the city of San Francisco on Treasure Island. In this picture you can see some fog rolling over the city in the background. 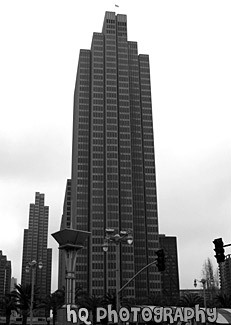 A tall black and white scenic picture taken of an office building in downtown San Francisco on a cloudy day. 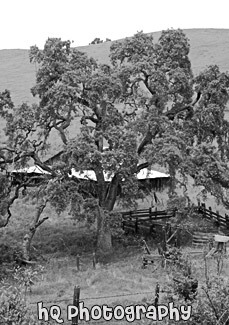 A scenic picture of a black and white tree and barn behind on a hill located in the hill of East San Jose, California. 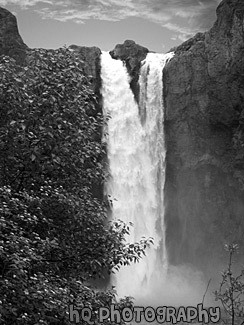 A black and white photo of the Snoqualmie Falls, which is located in Snoqualmie, Washington. This waterfall is an historic site in the state of Washington. Snoqualmie Falls is one of Washington state's most popular scenic attractions. 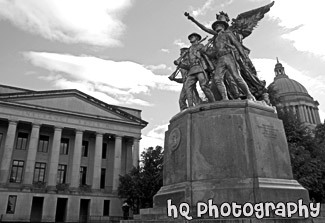 A scenic black and white picture taken of the Washington State Capitol Building, Insurance Building, and statue in front. 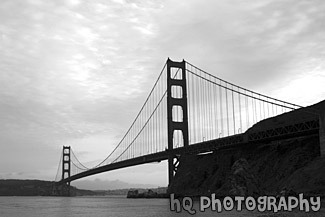 A scenic black and white picture taken of the Golden Gate Bridge in San Francisco, California on a cloudy day just before sunset. This photo was taken from the Marin County side of the bridge looking towards the Pacific Ocean showing the entire bridge in view. 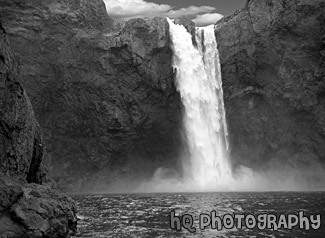 A black and white picture taken of the Snoqualmie Falls which is located in Snoqualmie, Washington. This waterfall is an historic site in the state of Washington. Snoqualmie Falls is one of Washington state's most popular scenic attractions. More than 1.5 million visitors come to the Falls every year.